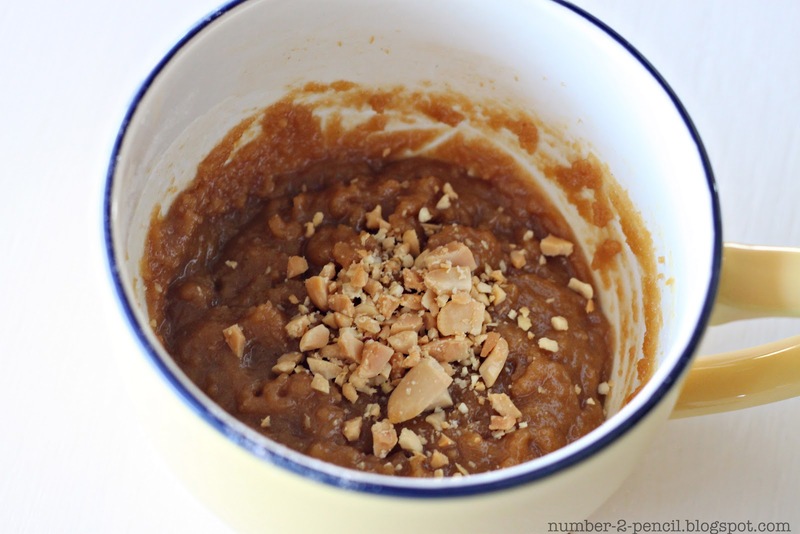 While I was working on the Chocolate Chip Cookie in a Cup recipe, I knew I wanted to make a peanut butter version. 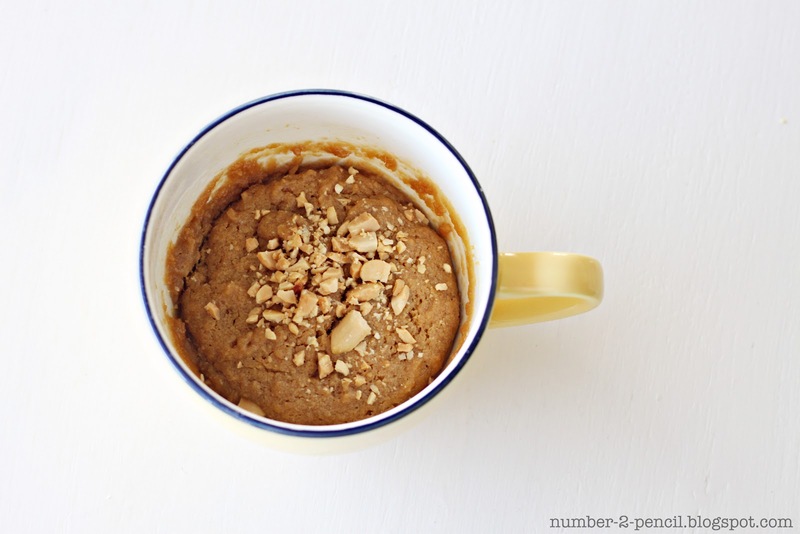 So here it is, fresh from the microwave, a Peanut Butter Cookie in a Cup. 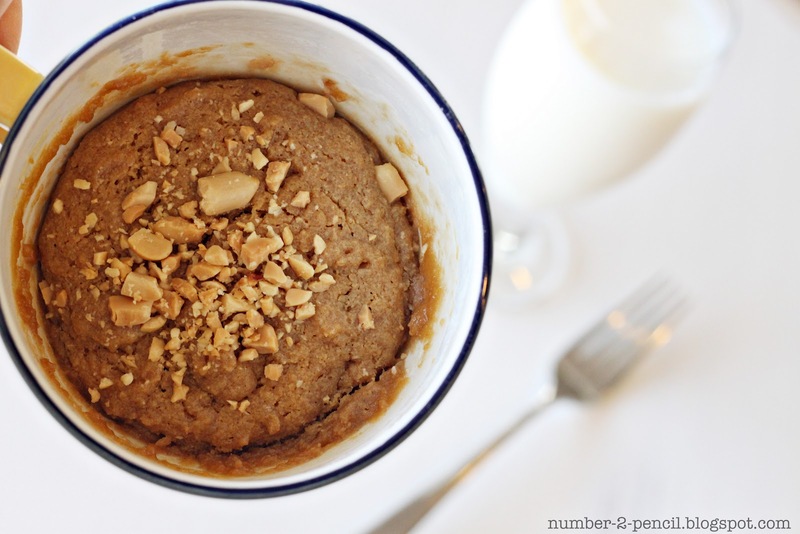 Start with one tablespoon of butter and one tablespoon of peanut butter. I used creamy, but chunky works too! Heat together in the microwave for about 30 seconds to melt butter and soften peanut butter. Add one tablespoon of packed dark brown sugar, one tablespoon of white granulated sugar, a tiny pinch of Kosher salt, and a splash of vanilla. Stir together. Add one egg yolk. Discard egg white, or save for another use, do no add egg white or the cookie will be puffy and cake like. 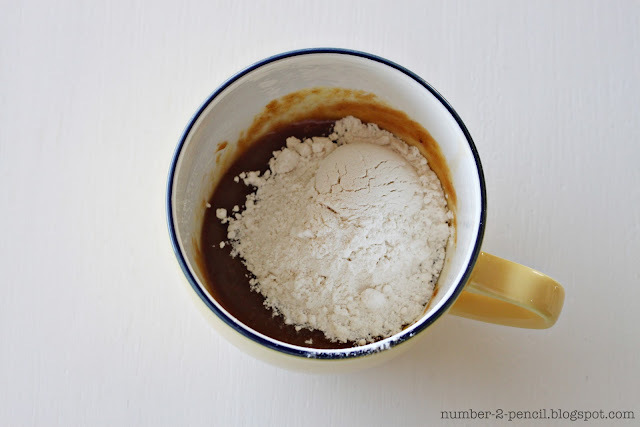 Add three level tablespoons of all-purpose flour. 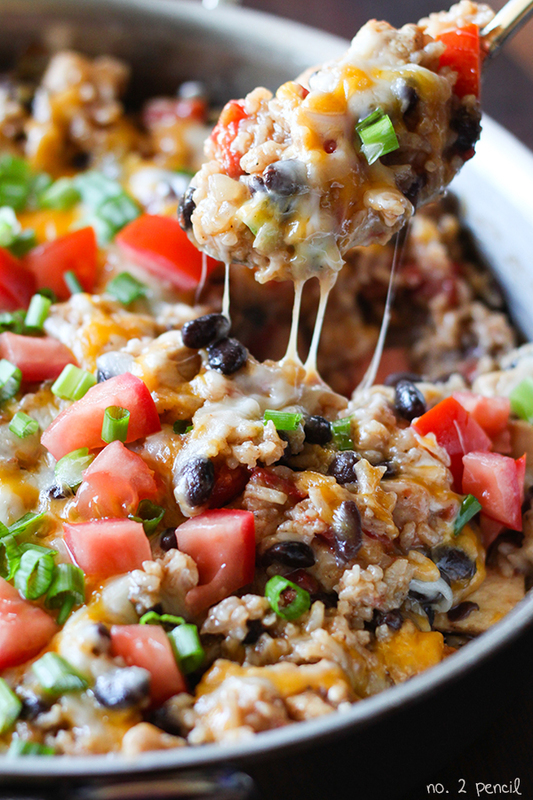 This step is optional, but makes for yummy crunch texture! 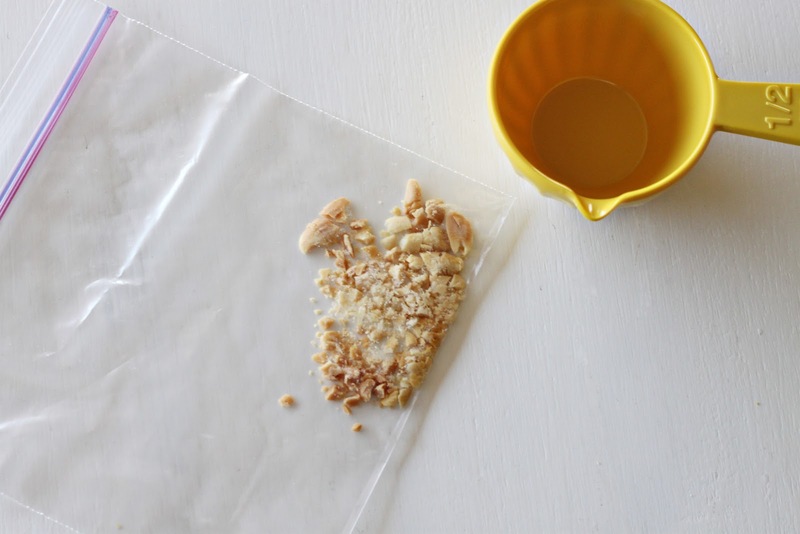 Use a measuring cup, or large spoon and a plastic storage bag to crush up a few peanuts. Sprinkle peanuts on top of cookie dough. 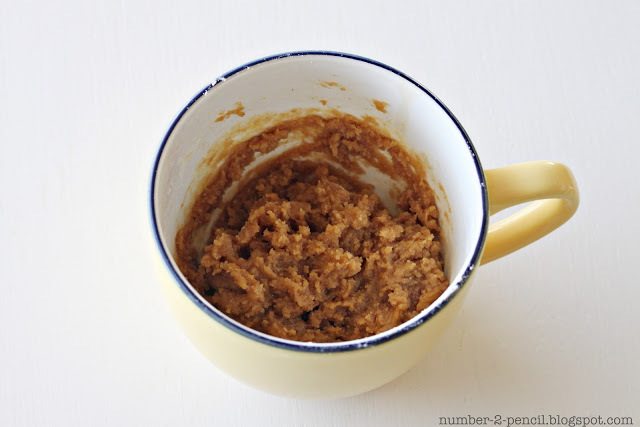 Microwave cookie dough for about 45 seconds, depending on the strength of your microwave. Start checking for doneness at 35 seconds to be safe. Enjoy the peanut buttery goodness with a glass of milk, or a scoop of vanilla ice cream! 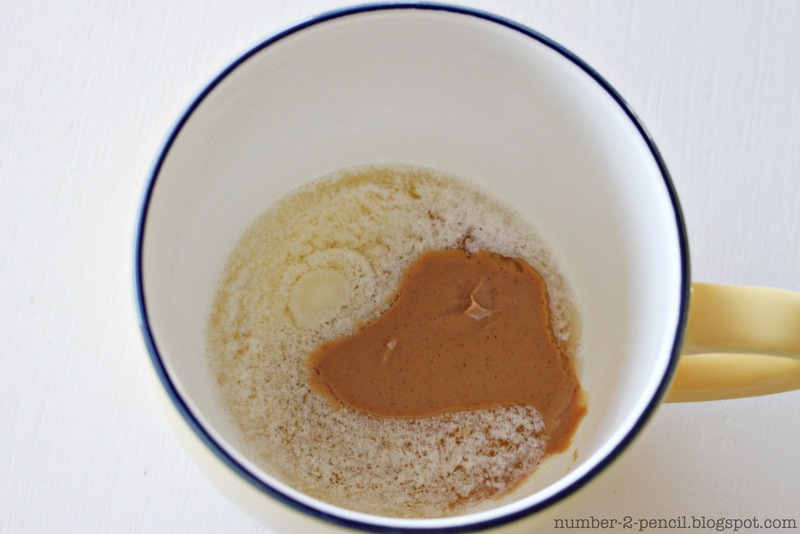 Melt peanut butter and butter together in microwave for about 30 seconds. Add sugars, salt and vanilla and stir to combine. Add egg yolk and stir again. Add flour and give a final stir. Sprinkle peanuts on top and heat in microwave for around 45 seconds. Microwaves vary, so start checking for doneness at 35 seconds. Serve warm! If you like this recipe, try my Sugar Cookie in a Cup and Chocolate Chip Cookie in a Cup. Mmmmm, I think I like this better than the chocolate chip version. This sounds good! I will try it next. I have already tried the Peanut Butter Cookie and the Chocolate Chip Cookie. Yummy! Do you mean instant oats as in the kind in the little packets that you microwave or Quick Cook oats that take about a minute to cook in boiling water on the stove? I just tried this and it was very good. Could have used a little more peanut butter flavor (I LOVE peanut butter!) I substituted Splenda for Baking and Splenda Brown Sugar Blend for the sugars and it still turned out yummy! This is so much better than the chocolate chip. The less time you keep them in the better! i tried this and it was good. the texture was between a cake and a cookie. It took a bit longer in the microwave, maybe cuz I made two at once. Is there a recommended mug size for best results? I was looking on Pinterest for recipes for Pina Colada cupcakes. I instead found your recipe for Peanut Butter Cup-cookies (long story). I am in no way disappointed! I had to microwave a bit longer than suggested, and then flipped it out onto a plate since the bottom didn’t quite cook and the top was drying, but the flavour….wow!! 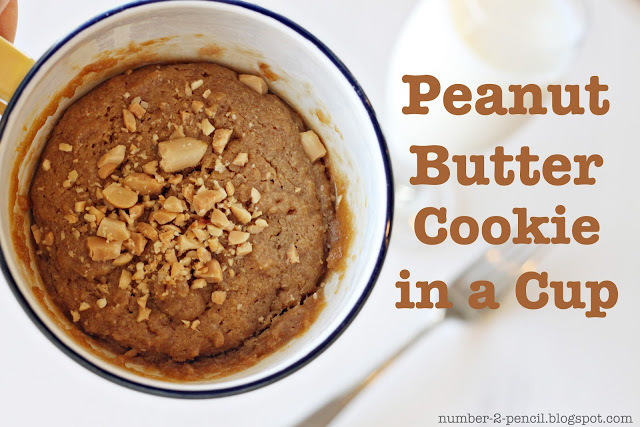 I’ve been craving peanut butter cookies for weeks and this has totally hit the spot! I also made your Sugar Cookie in a cup the other night and it was definitely a winner ^_^ So definitely going to be sharing these! Are you using real butter? Spread and butter substitutes won’t work and they make the dough thick and gummy. Let me know! 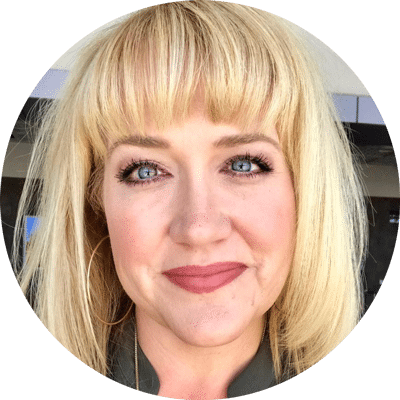 You can email me directly at melissa.pencil@gmail.com too! Yummm!! i’m eating mine right now! it is absolutely delicious! i have tried all the cookies in the mug things aand i love them! thanks so much for your awesome ideas! Can i use margarine as a substitute to the butter? I used Crisco, if tastes kinda grainy, but otherwise its fine. Hey, can the brown sugar be substituted with honey? If yes, by how much? Also, how can I measure out a tablespoon of butter exactly? Yours are such perfect blocks. I haven’t tried honey, but let us know if you do! I buy sticks of butter and just slice off a tablespoon amount, it’s marked on the outside of the butter wrapper. Thanks for checking in! Unfortunately mine didn’t turn out well, it was very dry except for the bottom which didn’t really cook! I guess I just need a different mug or something! Mine didn’t fare so well. It was extremely dry! I think my microwave may be the culprit though. The heating element is starting to wear down and sparks when I microwave anything, so I had to zap in 10 second increments. Will try again though! Hi! Thanks for sharing this recipe. 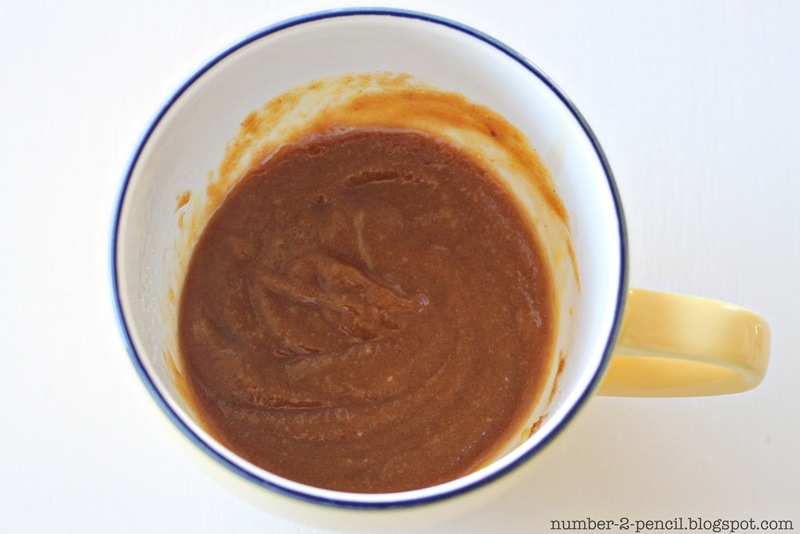 I tried it and because I love peanut butter and banana I didn’t use the tablespoon of white sugar and instead put 1/8 of a banana cut into little pieces in there at the end before microwaving. It was awesome! Yum. 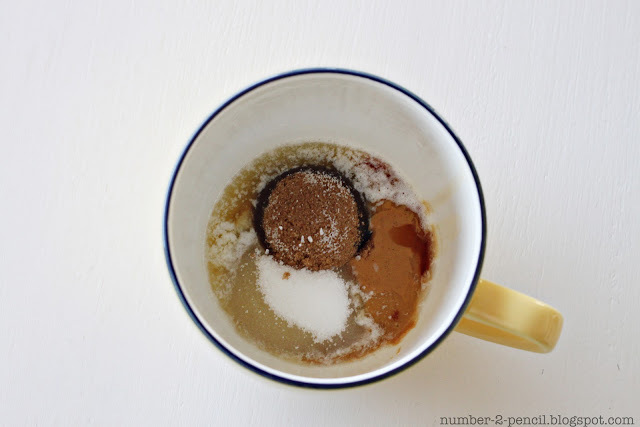 I think this is my favorite of all your “in a cup” recipes. Also, for folks who like peanut butter and chocolate together, I tried throwing some chocolate chips into this one and it worked REALLY well. One thing I’ve been wondering… do you need a whole egg yoke for these? 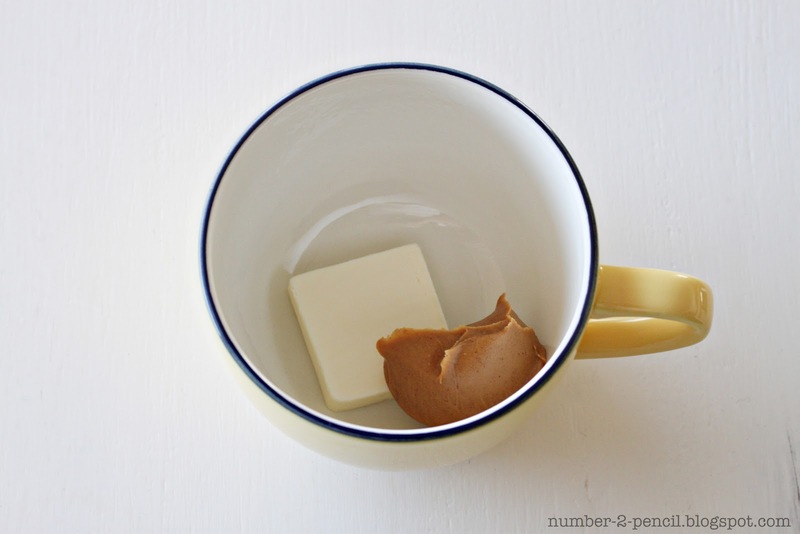 Since a full batch of cookies would probably have less egg per individual cookie, I’ve been wondering if you might be able to split the yoke and use each half to make cookies in a mug for two. Mmm the texture turned out well but could have been a bit more peanut buttery! Will add a little more peanut butter next time! Thanks for this recipe! I definitely like it better than the chocolate chip recipe. Added some oats and put it in a the bottom of a flat bowl I had, added some ice cream on top, and it was delicious! oh my. Oh, My! OH MY!!! THIS is just fabulous!!!! Did I mention it’s delicious? Can a food recipe get more than five stars, because this is definitely deserving! Came out of my microwave PERFECT! OH. MY!!! batter at the end..mmmmmm. 🙂 I just love the combination of peanut butter and chocolate together! Cooking Notes: I used Earth Balance instead of butter and it still worked out well. However, I think I over mixed and over cooked it a bit, so I will have to fix that next time. It was still amazing though, thanks for the recipe!! 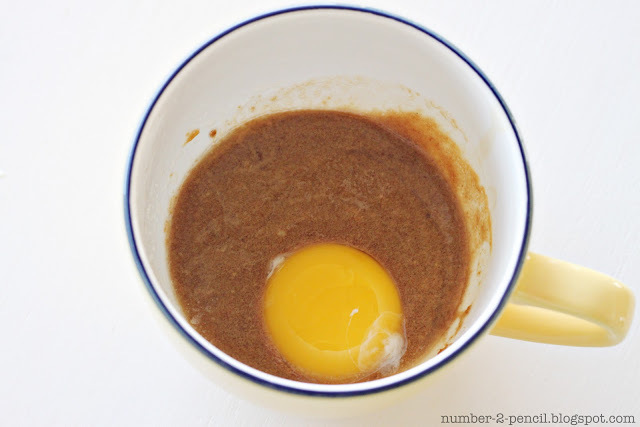 I substituted a 1/4 cup applesauce for the egg, and the cookie was quite tasty! I did have to microwave it for a lot longer (may be due to our old microwave). It didn’t seem like it was going to cook all the way, but it eventually started to. The butter knife wasn’t completely clean, but I was too impatient to wait :D. It had a little bit of an apple flavor. I didn’t mind though, as it lent a nice sweetness to the cookie. Thanks for the awesome recipe! I love this recipe! 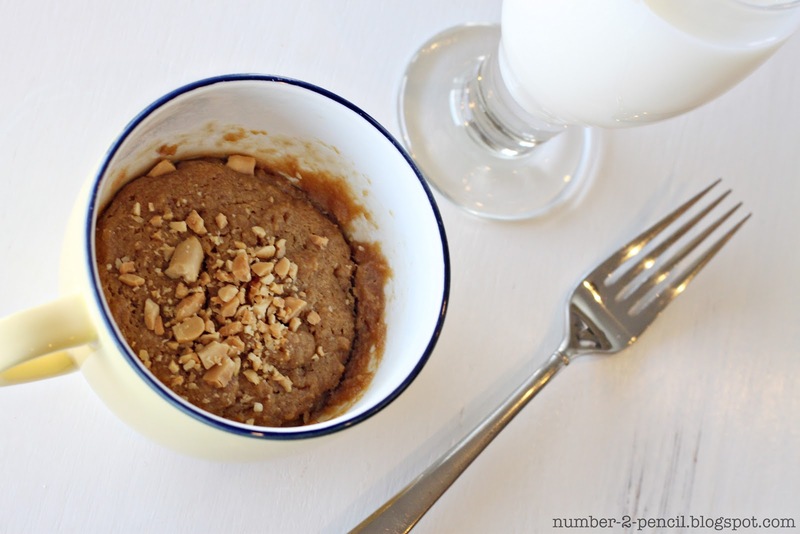 My 3 year old and I just enjoyed the best peanutbutter cookie in a cup ever. Thanks for posting this! I just tried this recipe and was really looking forward to it after reading all the good reviews. However, after 1:20 of microwaving the cookie, it was still gooey after the first 45 seconds, the cookie is extremely crumbly. It looked like the crumbled up cake toppings that some people put on top of cupcakes. I’ve checked and re-checked the recipe and I am pretty sure I followed everything exactly…do you have any idea what went wrong? I did use light brown sugar instead of dark brown; could that be it? I think you should try taking it out and letting it rest after 45 seconds. The heat from the cup will continue to cook the cookie. Good luck! This happened to me too! I just ate spoonfuls of crumbles (although very tasty crumbles). I used the ingredients as listed. I wonder what went wrong? Maybe because it was all natural peanut butter (no added oils)? I love natural peanut butter, but I don’t recommend it for this recipe. Just tried this recipe–it was easy and delicious! Will definitely make again! Thanks!! Cooked it too long, so it was crumbly like others had commented, but this was a first time deal! Tasted good, so I mixed the crumbs up with vanilla Greek yogurt, yum!! I will make this again, solves my craving for a cookie without having to make 2 dozen that would have shamefully eaten in a day.